Just finished another in the Mrs. Pargeter’s series, the sixth and final book to my knowledge. In this outing, Mrs. Pargeter is trying to do a favor for the widow of one of her deceased husband’s friends…return all the artwork he had “acquired” during his career to the rightful owners. We follow Mrs. Pargeter and her loyal band of ex-associates of her husband, Hedgeclipper Clinton, Truffler Mason, Gary the driver and some new additions. In this book, we also meet a DI Wilkinson, who spent most of his less than illustrious crime fighting career trailing along in Mr. Pargeter and crew’s wake. The story takes twists and turns and more than one villain is uncovered along the way. 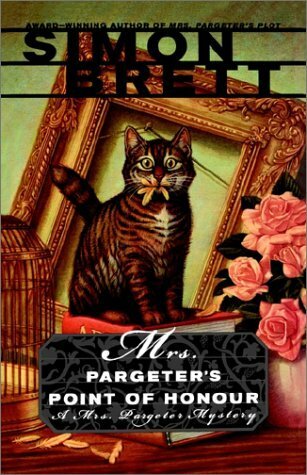 Mrs. Pargeter weathers it all, maintaining herself as a lady despite the company she keeps. The book is humorous in places, Mrs. Pargeter’s steadfast refusal to acknowledge that her husband was a criminal, and thrilling in others, the hiccups in the well laid plans. I have enjoyed this series immensely both as a humorous cozy and as a social satire.